Take part in a Spooky Mahjong contest to complete over 100 unique levels! 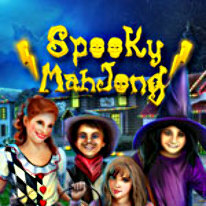 Take part in a Spooky Mahjong. Complete over 100 unique levels of different difficulty and dynamics to gain experience and earn points. Plunge yourself into the myriads of golden tiles! Improve your rank and progress through the game hierarchy.The main protagonist, who is a real fan of Mahjong, decides to take part in a world tournament of Modern Mahjong Puzzle. The tournament is split into several qualifying rounds. To take part in each round, you will have to achieve a certain rank.The objective of each level is to remove all of the golden tiles from the game board. There are many such tiles in Mahjong World Contest, which makes the game even more entertaining and adds variety to the level design (e.g. levels with floating golden titles).Levels are balanced according to the number of suits: there are classic layouts with the full set of 7 suits and there are also levels that can be completed faster due to the limited number of suits.